Its been a really busy weekend. And a tiring week before that where I found myself falling asleep by 9pm rather than work on anything. That’s partly why I haven’t blogged for a few days. And I’ve started to feel guilty about not blogging regularly! I’ve put this added pressure on myself to blog about my day, the small (or big) things I’ve done or made. That in turn leads to pressure to actually DO or MAKE things to blog about. Its a vicious circle. And its not like I haven’t got enough on my plate as it is. Another reason I haven’t blogged much is that sometimes I just don’t feel like it. I mean, I generally love talking about myself, my life and the stuff I do. Its just that sometimes I’m tired or not in a good mood, and what I write isn’t interesting or amusing, just flat and boring. So I apologize for the boring blogs I’ve written when I’ve forced myself to write out of a feeling of obligation to ‘blog’. I started to think “hey, I could be like that.” After all, I make stuff and play with furniture and paint. I’ve rennovated. Am constantly rennovating as a matter of fact. So I started to push myself to do more, blog more, share more of my adventures. With everything else I do in my day to day life, another load of ‘gotta do’ wasn’t putting me in my happy place. I realised that I blog cause I like to talk about myself and my life in a fun, upbeat way. Plus I like to show off, an added bonus. Make blogging into a job though, and the fun’s gone. I’ve never been good at doing things over and over again and maintaining enthusiasm for them. Which is why I make one or two of anything and move on. It was the same with everything I’ve done in my life. I learned to ride, got good. Moved on. I learned to dance, got good, won some competitions, moved on. I learned to roller blade, conquered that, moved on. I never quit, I get good, then I go onto other things. Get the picture? I’ll do anything that interests me. I’ll learn and work on it till I do it well, then I’ll find something else to work on. Maybe its why I can’t seem to make mega bucks selling a product. At least with paintings, even if I’m doing 5 poodles or 6 dobermans in a row, each painting is new and different. Each painting is an original. I guess that’s why I’ve been planning to open an esty shop for my recycled/re-used items. Every time I make something it will be different cause I work with things I find. I sure can ramble can’t I? I think my point is that I’m not going to worry about growing my blog and keeping up with the blog superstars. I’ll blog when I want, about what I want (and I don’t care if that’s not grammatically correct!) and I won’t worry about how many people read it. Anyway, this last week I had a moment where I could not help myself. I’ve been thinking about how I could use an old metal object I found in a tip shop a while ago. I think its from old fashioned weight scales but I’m not sure. 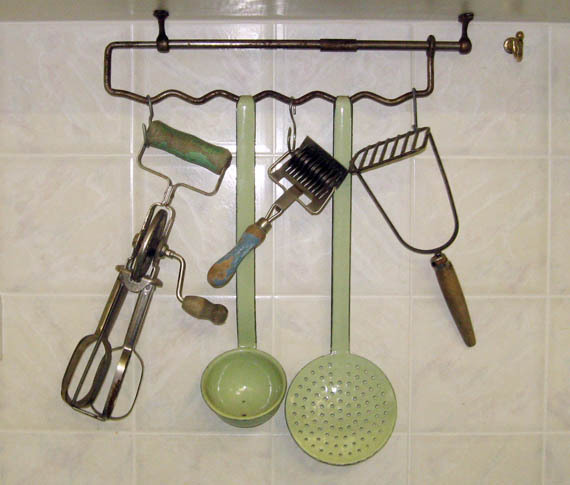 Whatever it is was originally, I thought it would work as a kitchen tool hanging rack. I’d been thinking of moving the spice cabinet and putting the hanging rack near the stove, but I hadn’t had time to do it over last weekend. I thought I’d do it this weekend but during the week I was overcome by that feeling where I just have to do it now. Do you ever get that feeling? Where you look at something and sensible you says “do it on the weekend” but the impulsive you starts pushing couches around the living room at 10pm at night? I fixed the rack thingy to the bottom of the top cabinets and used wire hooks Wayne had made to hang a few older utensils. It looked quite nice. Yep. It looked nice. But this is my kitchen and I need to cook in it. I don’t have enough space to just hang items on display. 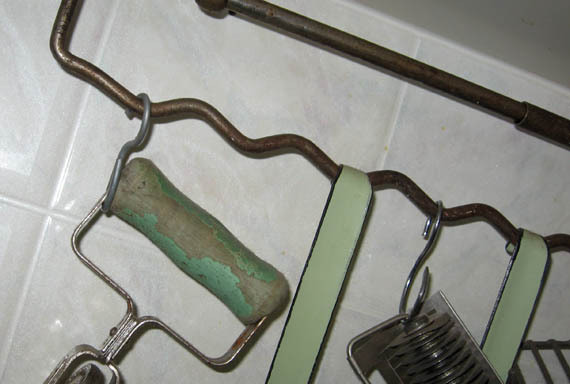 So, although it looked nice with all the old green and metal utensils, this is what it really looks like. 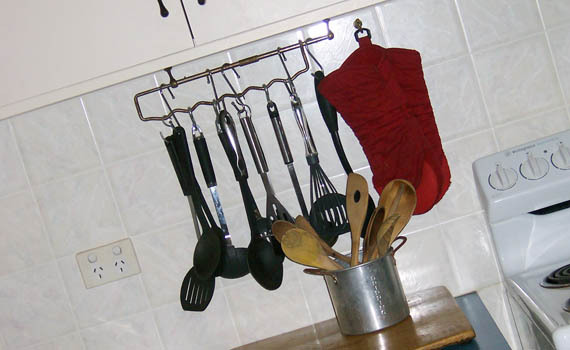 I hung the oven mitts back where they usually live, on the hook beside the stove. I moved the slice of timber chopping block I made under the hanging rack. I put all our wooden spoons in an old dripping pot I found at a 2nd hand store a few weeks ago. And I hung our plastic utensils from the rack. We have too many utensils. I think I need to go through my cupboards and drawers and get rid of things we no longer want or never use. We have too much STUFF. So, there’s another spot in the kitchen that’s had a ‘Zefi’ touch. I need to rip the whole kitchen out and redo it. Darn. I have no idea where all those gaps came from! Loved the blog and loved knowing you're okay (so you can pretend I didn't send you that email asking if you were alive!). 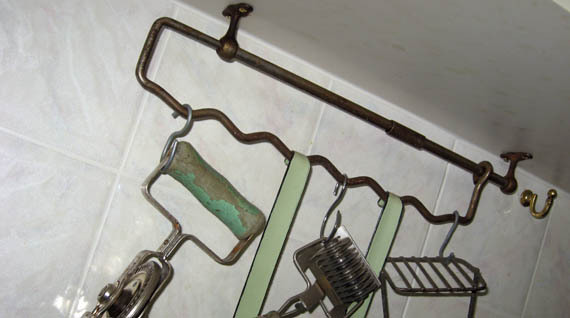 The rack is from a small wardrobe, used for hangers. It's pretty much what I was looking for when I told you about building a closet for my few hanging things, except I was looking for a telescoping one that would pull out toward me. 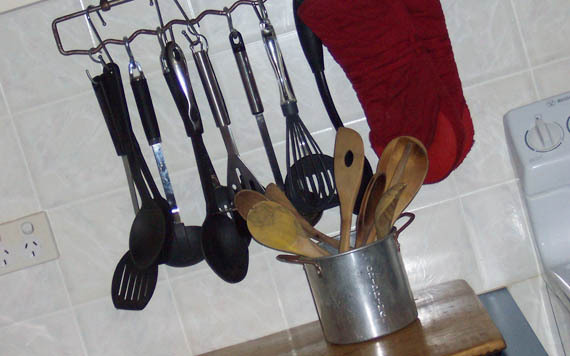 I like it as a utensil rack. It works great! Oh. Ok! Makes sense. And it is telescoping. I put it that way but it moves out on one side so if you put it around the other way it would come out towards you.